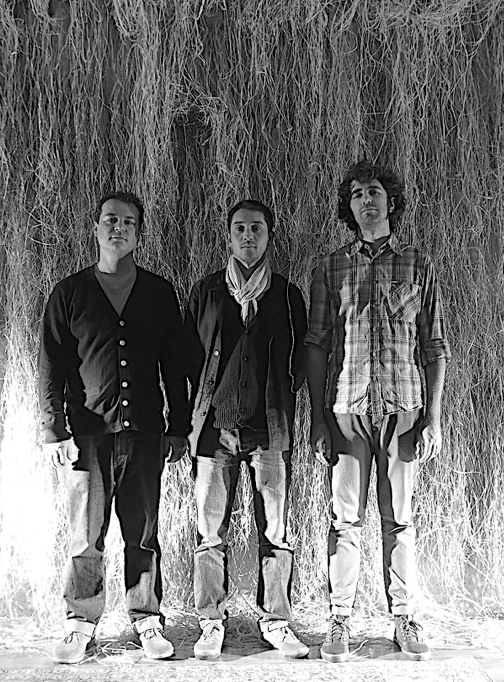 Natura Morta is an international trio comprising of violist Frantz Loriot, contrabassist Sean Ali and percussionist Carlo Costa. The ensemble is dedicated to exploring musical structures and relationships through collective all-acoustic improvisation. The ensemble creates acoustic sound-sculptures and slow moving sonic landscapes through the use of a variety of strategies. Nontraditional techniques and instrumental preparations are employed by the trio to produce a wide range of timbers. The musical scope of the ensemble stretches from heated silences to relentless drones, to frantic hyperactivity. Natura Morta released its eponymous debut recording in March 2012 on the Brooklyn-based record label Prom Night Records. The band performed several concerts in New York City and toured the East Coast/Midwest of the US twice that year. 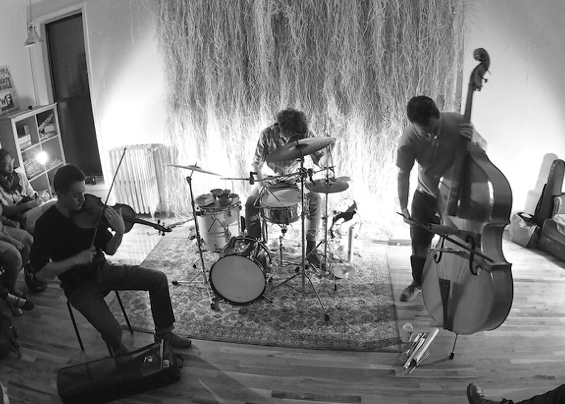 In October 2012 Natura Morta released a live recording on a split tape with guitarist Nick Millevoi on the Philadelphia-based label Edible Onion. In January 2014 the trio released Decay, its second studio recording, on the British label FMR Records. In February 2017 ‘Environ’, the band’s fourth album was released on Neither/Nor Records. Natura Morta toured in Europe in the winter of 2017 as well as in the spring of 2018. 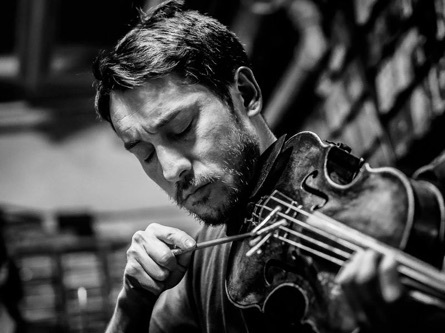 French-Japanese violist Frantz Loriot performs solo as well as in various ensembles by way of improvisation and electronics, crossroads of different musical genres: improvised music, experimental, rock, contemporary music and electronics. He has contributed to multidisciplinary projects related to dance, image and poetry. Frantz Loriot leads two large ensembles, the European Notebook Large Ensemble, a 10 piece ensemble with Swiss, Japanese, Belgian and Italian musicians with which he released "Urban Furrow" on the Portuguese label Clean Feed in May 2015; and the NYC based 12 piece Systematic Distorsion Orchestra in which Frantz reunites some of the finest NYC based improvisers and which released the album “The Assembly” in May 2016 (OutNow Recordings). Beside these projects, Frantz released his debut solo recording "Reflections on an Introspective Path" on the NYC-based label Neither/Nor Records. In 2016 Frantz was invited to be the artist in residence at the prestigious Météo - Mulhouse Music festival where presented a new composition called Der dritte Treffpunkt. For this occasion Frantz led and assembled a new French-Swiss quartet, Der Verboten, to rehearse and perform the piece. The ensembles includes pianist Cédric Piromalli, saxophonist Antoine Chessex and percussionist Christian Wolfarth. Active in a number of international collective ensembles, his other current projects include: baloni - with Joachim Badenhorst (reeds) & Pascal Niggenkemper (contrabass), Natura Morta - with Sean Ali (contrabass) & Carlo Costa (percussion), duos with Jeremiah Cymerman (clarinet), Christoph Erb (saxophones) & Christian Wolfarth (percussion). He appears as a sideman in Joachim Badenhorst's Carate Urio Orchestra, Tobias Meier's Im Wald and Silvan Jeger This Difficult Tree. In addition to his own projects he has also worked alongside many musicians such as Barre Phillips, Joëlle Léandre, David S.Ware, Anthony Braxton & Walter Thompson Orchestra, Catherine Jauniaux, Emilie Lesbros, Duane Pitre's ED09 ensemble, Daniel Carter, Sabir Mateen, Michael Formanek, Andrea Parkins, Franck Vigroux, Jean-Luc Cappozzo, Alexei Borisov, Theresa Wong, Ernesto Rodrigues, Hilmar Jensson, Kita Naoki, Simon Nabatov, Steve Swell, Yagi Michiyo and Yasumune Morishige among many others. While living in NYC, he created and curated Ze Couch Series in Brooklyn, NY, from 2009 to 2012. Frantz appears on CDs released on international labels such as Clean Feed, Creative Sources Recordings, Intakt Records, Peira, FMR, Sickcore, Impressus Records, Prom Night Records, Basses Fréquences, Quiet Design, Edible Onion, ,0, Neither/ Nor Records, OutNow Recordings, etc. Frantz studied music in Paris with several professors (Mari Yasuda-Raclot, the Pons brothers, Nicolas Dupin, Ivry Gitlis, Yukari Tate & Pascal Robault) and was brought to improvisation by Régis Huby, Joëlle Léandre, Barre Phillips, and David S. Ware. He was initiated to sound massage by its creator, Thierry Madiot. After having lived in Paris and New York City, Frantz relocated in Zürich, Switzerland in 2012. 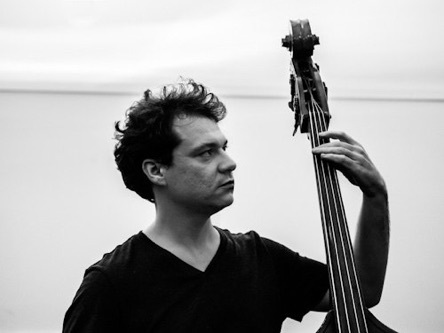 Sean Ali is a double bassist, improviser, and composer working in a variety of projects and contexts. Originally from Dayton, OH, he currently resides in New York City where he is an active participant in the city’s vibrant musical culture both as a performer and occasional curator. His most notable ensembles include Natura Morta (with Frantz Loriot and Carlo Costa), PascAli (with Pascal Niggenkemper), While We Still Have Bodies (with Michael Foster, Ben Gerstein, and Flin van Hemmen), Hag (with Brad Henkel and David Grollman), and a string trio with Joanna Mattrey and Leila Bordreuil. These projects have been released on a diverse array of record labels, including FMR Records, Prom Night Records, Creative Sources Recordings, and Neither/Nor Records. His multidisciplinary projects include Phantom Circuit (with photographer and video artist Wenxin Zhang) and Two Impulsive Instruments (with Butoh dancer Azumi Oe). In 2017 Sean released his solo debut recording My Tongue Crumbles After on the Brooklyn-based label Neither/Nor Records. The album features eight improvisations for acoustic double bass. On a few selections Sean also makes use of tape collages which he assembled from field recordings and voice recordings. In 2016, one of Sean’s projects, While We Still Have Bodies, collaborated with video-artist Cheng Ran for “Diary of a Madman,” which ran at the New Museum from October 19th, 2016 to January 15th, 2017. Loosely based on a Lu Xun’s short story of the same name, the exhibit presented a simultaneity of video and audio narratives to which While We Still Have Bodies contributed two hours of recorded music that was acoustically spatialized throughout the exhibit. In 2010, Sean co-founded Prom Night Records with Jason Anastasoff, Dustin Carlson, David Grollman, Peter Hanson, Brad Henkel, Weston Minissali, Nathaniel Morgan, Booker Stardrum, Owen Stewart-Robertson, and Jacob Wick. The label has twenty-two releases to date. From 2012-2014, Sean was co-curator of Ze Couch, a house series based in Brooklyn and Queens that presented monthly concerts. From 2014-2015, he co-curated 65Fen Music Series, a weekly concert series in Brooklyn, which he also co-founded with Patrick Breiner, Michael Foster, Jake Henry, Adam Hopkins, and Josh Sinton. He has since curated several events at a variety of venues in NYC, including Fridman Gallery, Gallery 456, and JACK. Aside from his regular projects, Sean has performed with many notable musicians, including Tony Malaby, Tatsuya Nakatani, Steve Swell, and Jack Wright. He has toured extensively in the United States and Europe. 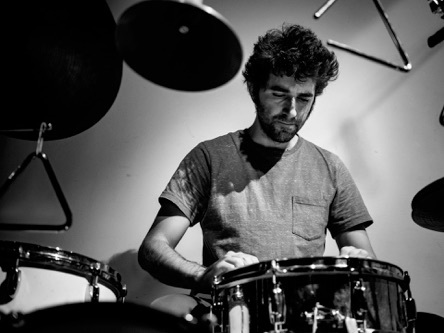 Percussionist and composer Carlo Costa was born in Rome, Italy in 1983. Since 2005 he has been living in New York City. His main focus is on music which is largely improvised and experimental in nature. His current projects include: the large ensemble Acustica, thirteen piece ensemble of acoustic instruments dedicated to performing Carlo's compositions; Natura Morta, an improvising trio of percussion and strings (with violist Frantz Loriot and bassist Sean Ali); Earth Tongues, trio of brass and percussion (with trumpeter Joe Moffett and tubaist Dan Peck); Ancient Enemies, with alto saxophonist Nathaniel Morgan and violist Joanna Mattrey; a trio with saxophonist Jonathan Moritz and bassist Sean Ali (which formerly was the Carlo Costa Quartet and included also trombonist Steve Swell); The Quartet, a percussion quartet featuring David Grollman, Flin van Hemmen and Max Jaffe; a percussion duo with Flin van Hemmen; and a new collaborative duo with Norwegian guitarist Håvard Volden which will be releasing it’s debut album in the fall of 2017. In addition Carlo has been working on a solo percussion project for several years and was invited to present it at the Mullbau Winterfestival in Luzern (February 2017). Carlo is currently working on his a solo debut album which will be released in the fall of 2017. As a sideman Carlo's main collaborations include the experimental folk-jazz group Laila and Smitty which is led by Kenny Warren (trumpet and voice) and includes Myk Freedman on lap steel, Jeremiah Lockwood on dobro and guitars, and Adam Hopkins on bass; Mujô Quartet, avant-garde jazz group led by French clarinetist Jean-Brice Godet (with Michaël Attias on alto saxophone and Pascal Niggenkemper on bass) and a trio led by Belgian electric bassist Raphael Malfliet (featuring Todd Neufeld on guitar). In the past few years Carlo has shared the stage and/or recorded with musicians such as Darius Jones, Audrey Chen, Nate Wooley, Steve Swell, Connie Crothers, Brad Henkle, Tony Malaby, Joachim Badenhorst, Denman Maroney, Pascal Niggenkemper, Daniel Carter, etc. He has performed throughout Europe, the US and Japan with a variety of projects. In November 2014, Carlo launched Neither/Nor Records which is dedicated to experimental and improvised music.